This was the first Pokemon game that I ever played and it will always be my favourite. If I could only play one Pokemon game it would be this one. I loved the Pokemon Black and White games and their sequels. It was the first time I felt like I had seen a lot of new Pokemon and the story definitely picked up. 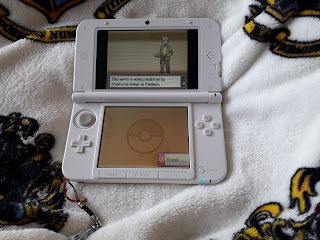 Furthermore, there was an amazing feature of seeing how many Pokemon are available to catch on each route which made catching many different Pokemon a lot easier and more fun. This felt like a relaunch of Pokemon with a brand new French inspired region and a new Pokedex. I enjoyed this game so much. I remember spending a long time hatching Pokemon and it was the first time that I could globally trade, including wonder trade (trading random Pokemon with trainers from around the world) and it was amazing. So, those are my favourite Pokemon games. However, I have some issues with the way that Pokemon games have been going and I wanted to see if others feel the same way. I didn’t really enjoy Pokemon Alpha Sapphire even though I loved the original and I still haven’t completed Pokemon Ultra Sun and I figured out why. Pokemon games are becoming too gimmicky. They are adding all these extra features in and expanding dialogue. It used to be that you could quickly speak to all of the people in a town and gain items or useful information. Now you can be there for a long time tapping through pages of useless dialogue. Additionally, the focus has been taken off of having enjoyable battles through adding additional features such as mega stones and z moves which take time to use and honestly, I barely ever used the mega stones. What I love about Pokemon games is going through routes, catching new Pokemon, training them up, evolving them, battling a ton of trainers, getting gym badges, becoming a champion and unearthing a legendary Pokemon. However, recent Pokemon games have been obscuring this. I don’t want to spend half of the game talking to characters that I will never see again. I don’t want to be forced to play mini games when I would rather be catching and battling. I want more of what Pokemon games used to hold. Do you feel the same? Let me know in the comments. *I receive a small commission from purchases made using my affiliate links. This commission helps me to be able to continue making great content for you to enjoy. Thank you for supporting my blog!